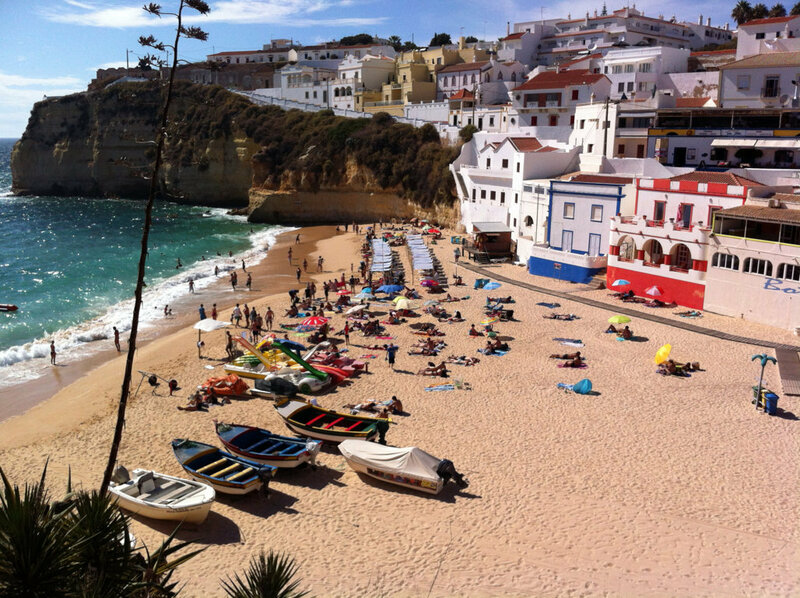 Praia do Carvoeiro is the beach of the popular town of Carvoeiro. Beloved for its extraordinary rock formations of Algar Seco. 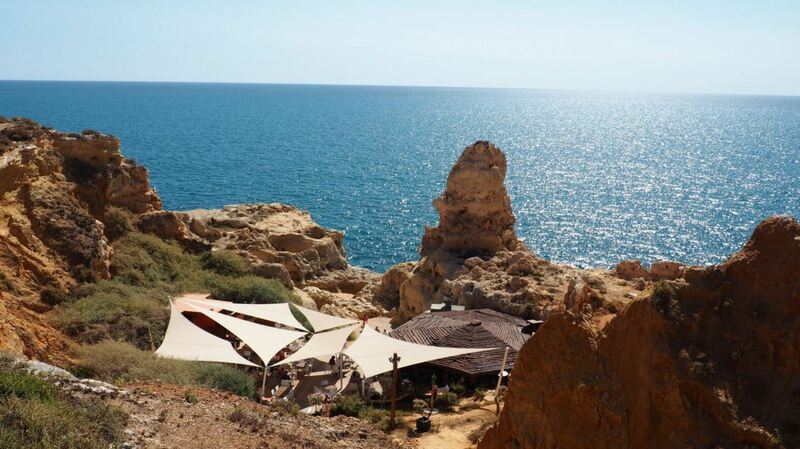 Carvoeiro is a favourite holiday destination in the Algarve, catering to every type of tourist. There is no better way to get excited about visiting Praia do Carvoeiro than to watch the video below. Like all the other beaches nearby, Praia do Carvoeiro is a small and beautiful beach. The beach lies within a small bay, with high rock formations on both sides. 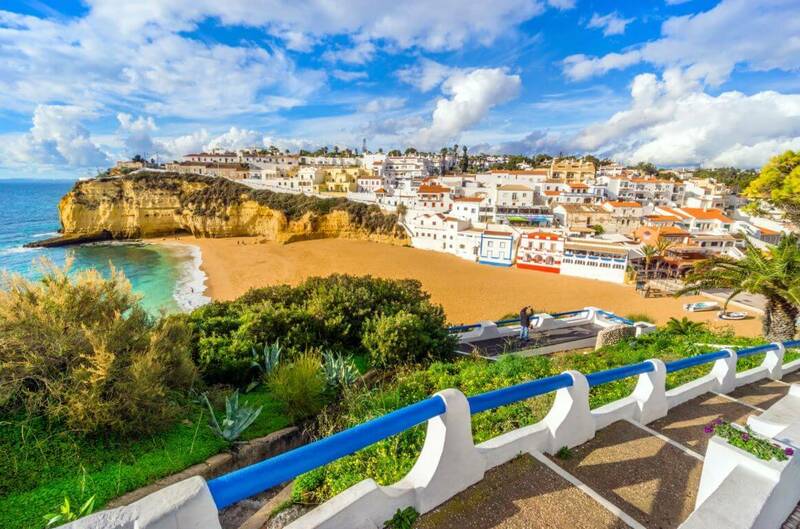 The background of the beach is the picturesque village of Carvoeiro. On the beach you can see the white houses of the fishermen, along with the colourful fishing boats on the beach. The multicolored buildings surrounding the beach have a very lovely and traditional feel. This makes for a charming view, that you can see on many postcards of the Algarve. The sea here is nice and clean, but can be a little unpredictable. Sometimes the sea is very calm, but it can have strong waves at times. Be careful with children in the water. Also beware that the sea gets deep quite quickly. The temperature of the water can be really cold, but in the summer you will find plenty of people in the water. After all, swimming can be very refreshing on a hot day. The sand on this beach is quite sharp and coarse. It can be a bit hard on the feet. There are also many shells on the beach. Make sure to bring flip flops. 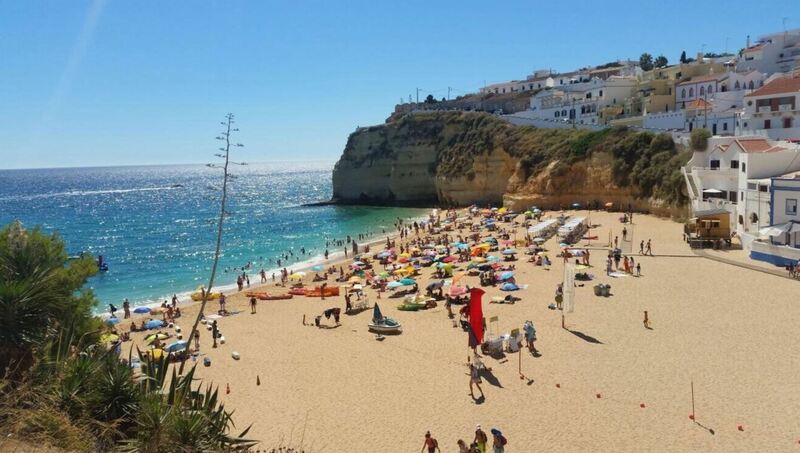 Since Praia do Carvoeiro is a popular village among tourists, it can get very crowded on this small beach. This is especially true in the summer. Outside the high season it is much less crowded. Make sure to arrive early, in order to find a good spot on the beach. One downside of the popularity of Carvoeiro among tourists, is that the sunbeds are pretty expensive. In the summer they can charge up to 30 euros for two sunbeds. Near the entrance of the beach you will find many restaurants and bars along the promenade. There is a lot of movement and this makes the beach very lively. Are you looking for a holiday in a charming town in the Algarve? 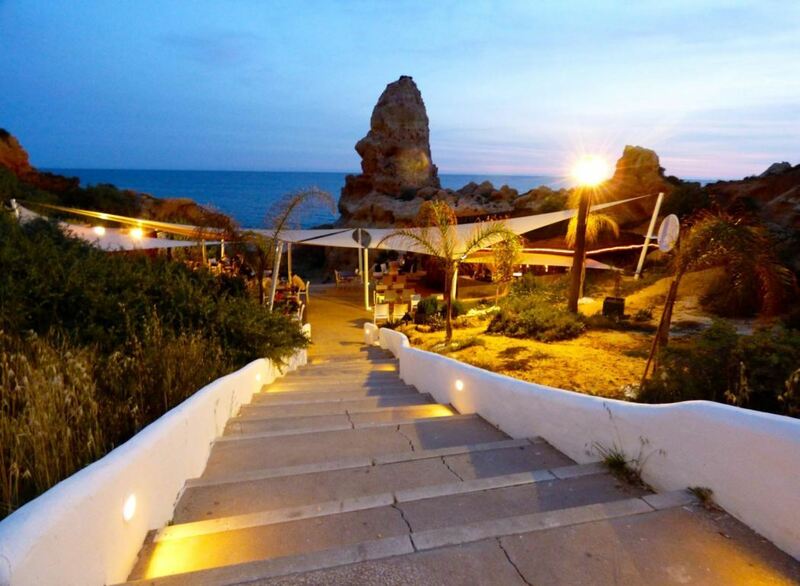 Then Carvoeiro is just the place for you. Near the beach you will see several fishing boats. During the day, these boats are used to show tourists the coastline of the Algarve. There are many boat tours leaving from this beach. For a small fee, fishermen can show you the area by boat. 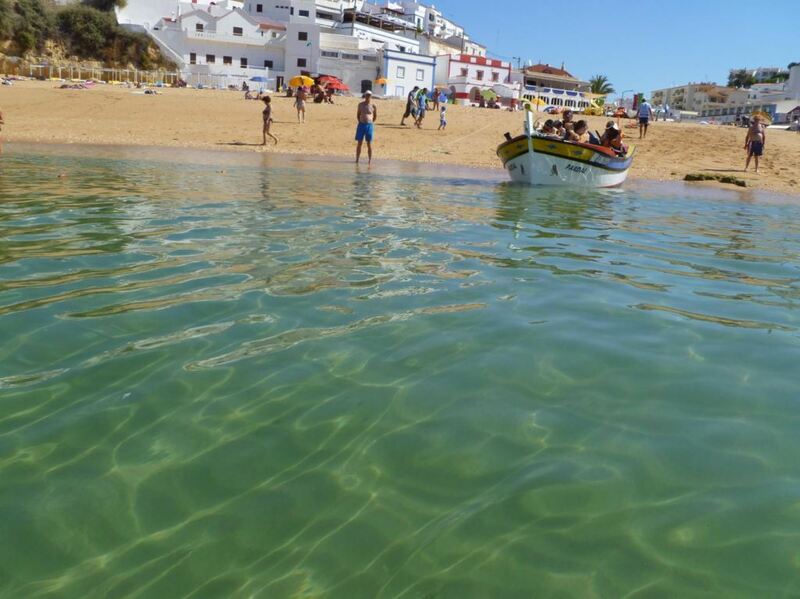 Be careful when swimming near Carvoeiro, since there are many boats arriving and leaving. There is also the possibility to do a variety of water sports at Carvoeiro, ranging from jet skiing to kayaking. It can make your trip to the Algarve extra adventurous. 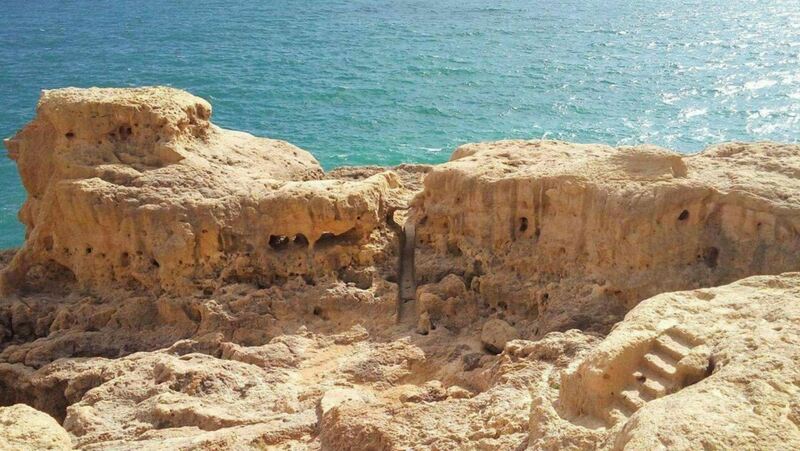 It is possible to walk on the cliffs surrounding the beach. This provides a spectacular view over the area. 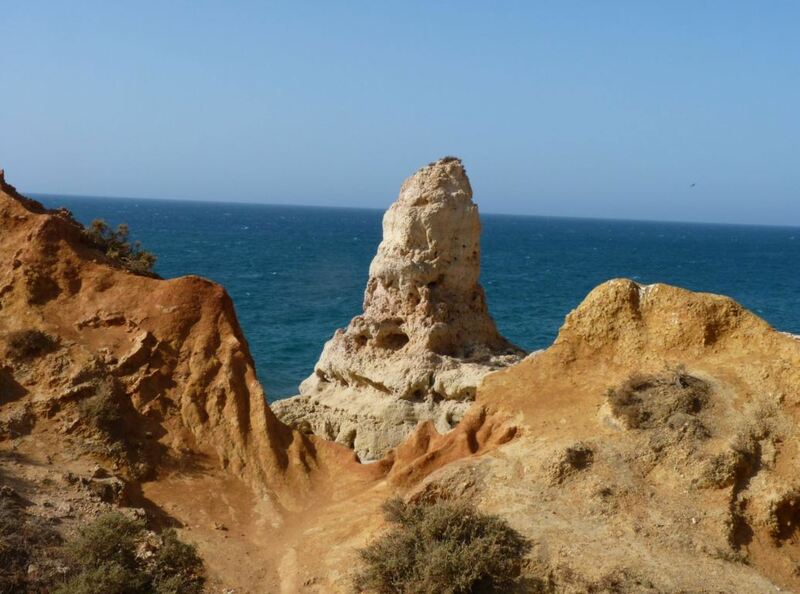 There is a stunning walking trail going from a small fortress up on the cliffs to the rock formations of Algar Seco. 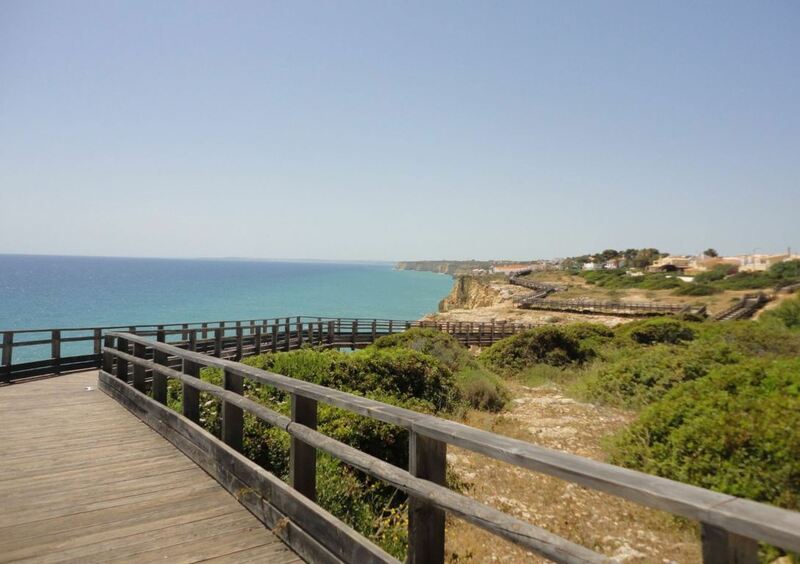 This walking trail is called the Carvoeiro boardwalk. This wooden boardwalk is about 570 meters in length and the walk takes about 10 minutes. The walking trail is very near the center of Carvoeiro and is so beautiful that you don’t want to miss it when you are in the area. From the center, just walk up and east (on the left side of the beach). The boardwalk itself is well maintained. It has places that allow you to sit, in order to watch the sunset from here. It is wonderful to walk on the boardwalk and smell the fresh air of the Atlantic Ocean. 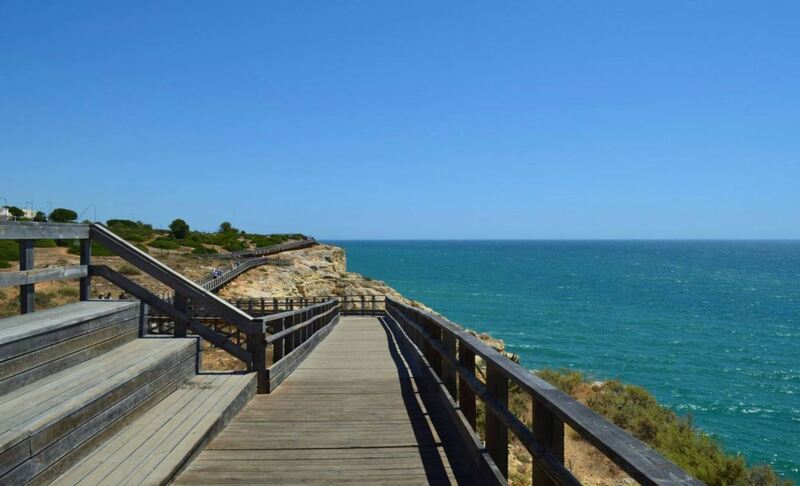 According to TripAdvisor, the Carvoeiro boardwalk is one of the best things to do in Carvoeiro. Highly recommended. 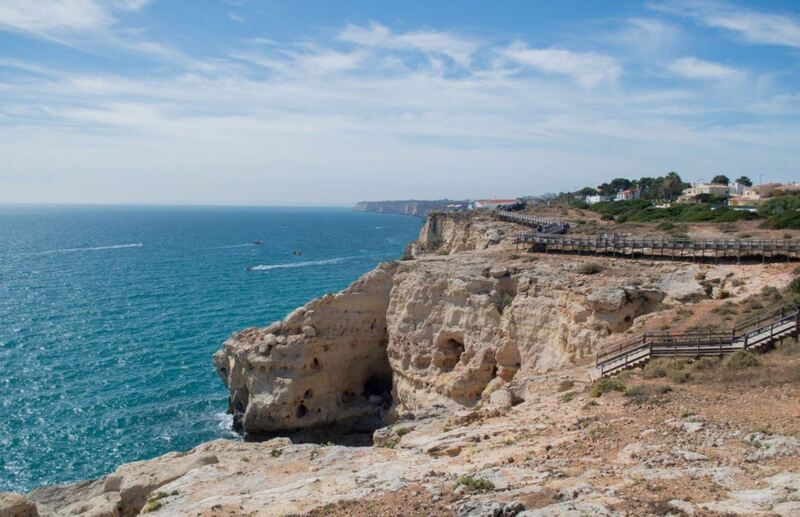 Walking on the Carvoeiro boardwalk will give you fantastic views over the rock formations and the Atlantic Ocean. It is a marvelous place for pictures. 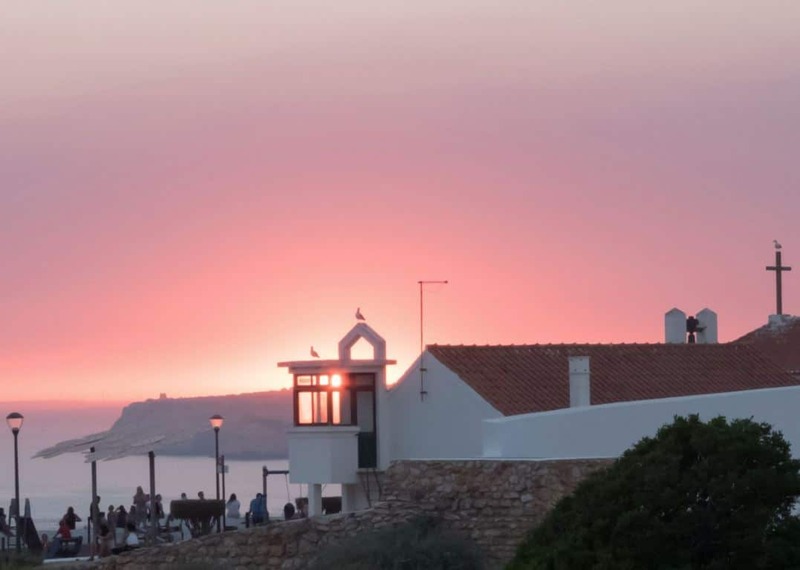 The video below shows you the beautiful scenery of the Carvoeiro boardwalk. The boardwalk is also accessible by wheelchair. Beware that Algar Seco itself is not for the disabled. Coming from the center, the Carvoeiro boardwalk starts at the Forte e Capela de Nossa Senhora da Encarnação (Fortress and Chapel of Our Lady of the Incarnation). This fortress once protected the area of Carvoeiro. It was built in 1670 and severely damaged by the earthquake of 1755. The fort was reconstructed in 1825. 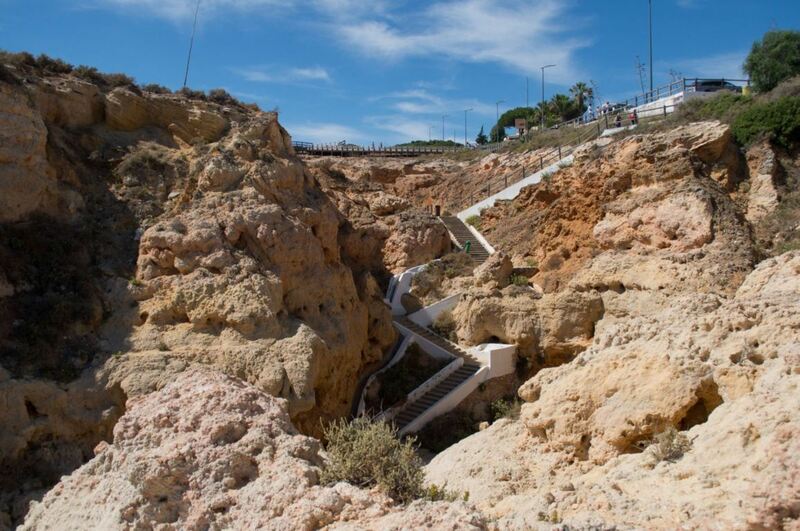 The Carvoeiro boardwalk takes you to Algar Seco. This is an area with unique rock formations. Here, you can visit caves and appreciate the beautiful scenery. 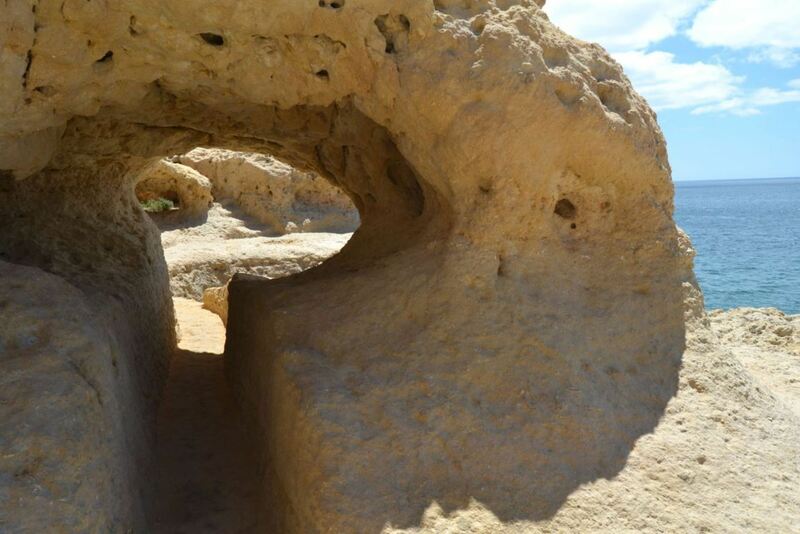 The structure of the rocks resembles a moon landscape, and is all made by erosion. Algar Seco is situated a bit less than 1 kilometer from Carvoeiro. 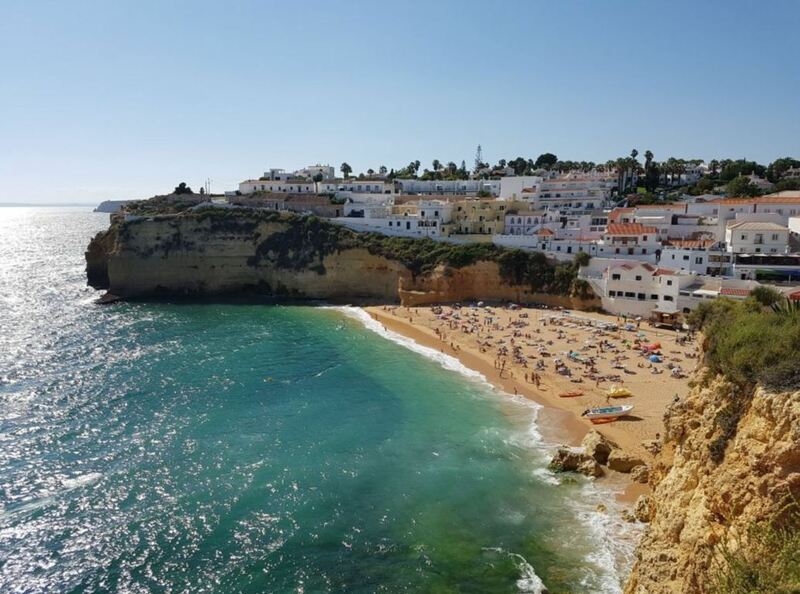 Algar Seco is one of the best viewpoints in the Algarve and is rated by TripAdvisor as one of the best things to do in Carvoeiro. When you arrive, you will see a restaurant called the Boneca Bar. One rock that obviously stands out is the pinnacle on top. Locals back in the day said the rock looks like the head of a doll. In Portuguese, doll is translated as boneca. This is where the name comes from. The restaurant itself focuses on seafood, but there is plenty of choice for non-fish eaters. It is really an experience to eat here. The views are breathtaking. You can also just go here for a drink. The bar has excellent juices. Walking down, past the restaurant, you will reach the entrance to a tunnel. You will end up in a cave, called Gruta da Boneca. Here you will see something spectacular. 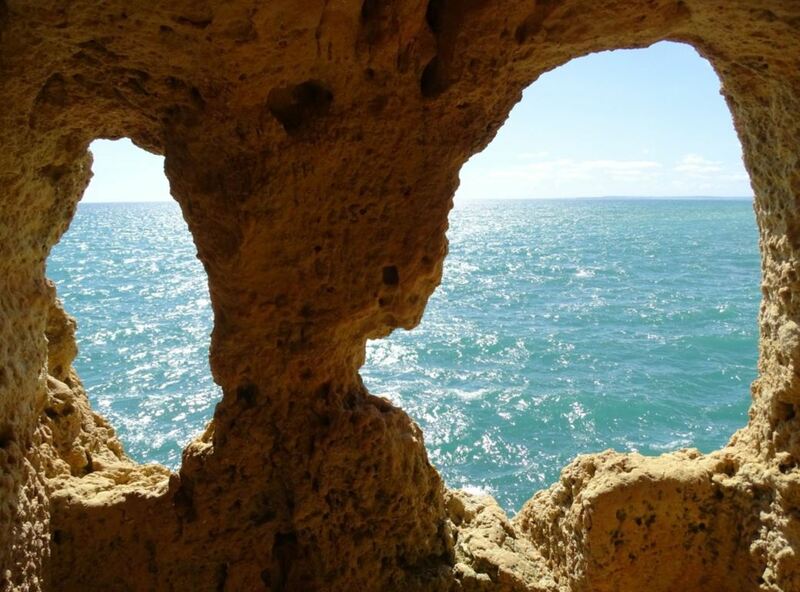 Inside the cave, there are two eroded holes in the rocks, looking out over the Atlantic Ocean. 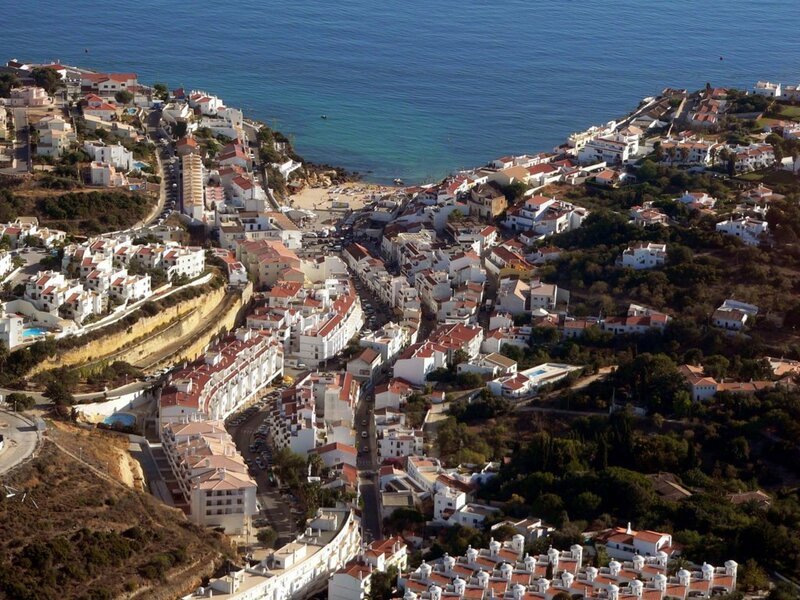 This is the most famous viewpoint of Carvoeiro and the highlight of Algar Seco. It is an excellent place to take pictures. The two holes are said to be the eyes of the doll (boneca). 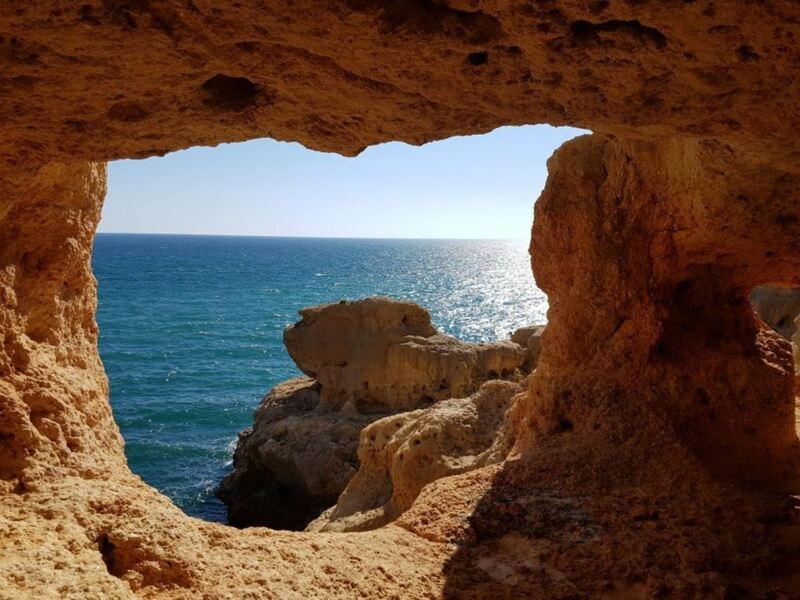 You can walk even further and discover that Algar Seco actually is a network of holes and caves, with some of the most amazing rock formations in the Algarve. 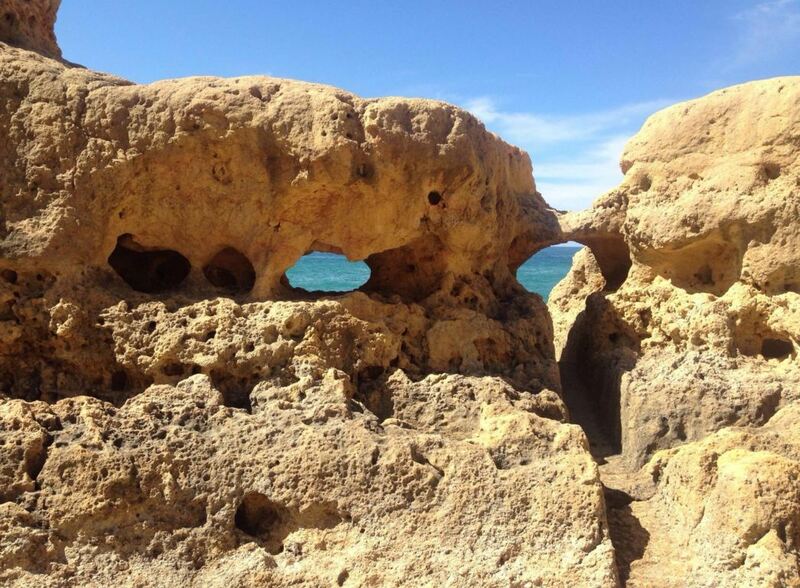 When you walk around here you will find more astonishing viewpoints, including holes in the rocks, which provide a view over the sea. There is also a rock that looks like the letter P.
You can walk all the way down to the caves near the water. Watch out: the steps below can be slippery at times. This is what you will see when you are walking down below. You will see several natural pools here. During low tide, the natural pool is teaming with life and sometimes you can even see small fishes. 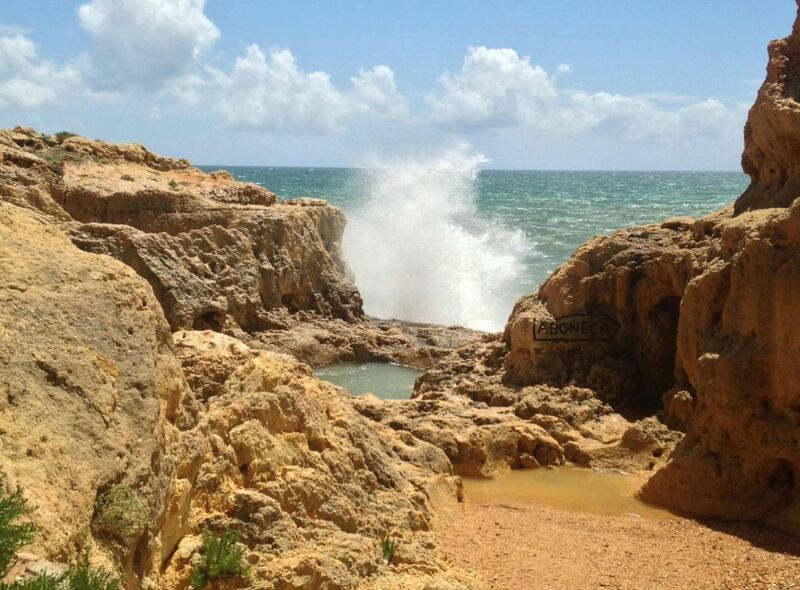 During high tide, the natural pool is filled with water. If you want, you can even swim in the natural swimming pool. The water here is very clear. It really is spectacular. There is also a spot which is popular for cliff jumping. During summer, you will see courageous teenagers and adults jumping from the rocks here. It is safe to jump, since there are no rocks in the water. 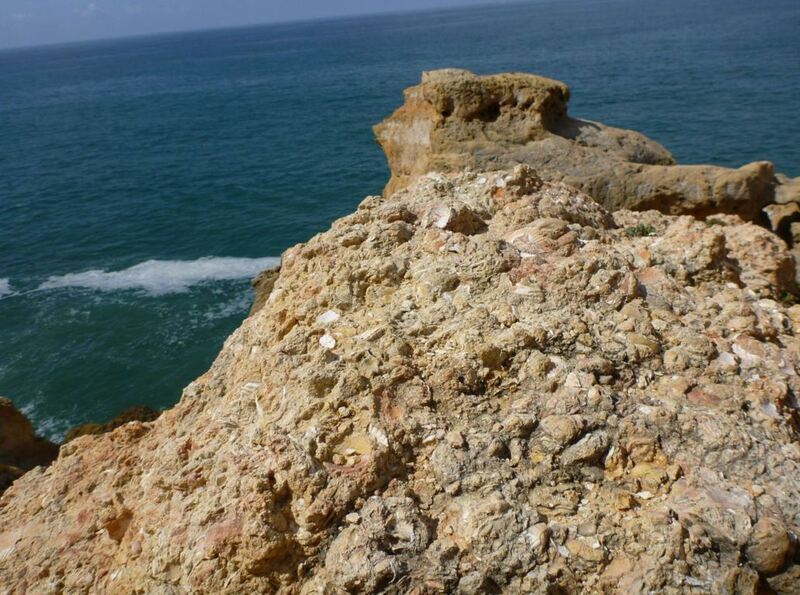 Notice the fossils in the rocks when you are walking around Algar Seco. 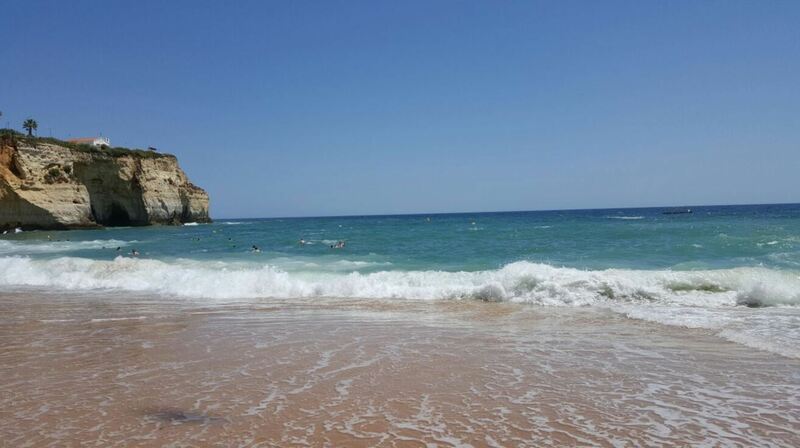 Slightly to the west of Praia do Carvoeiro, you can find a small beach named Praia do Paraíso (paradise beach). 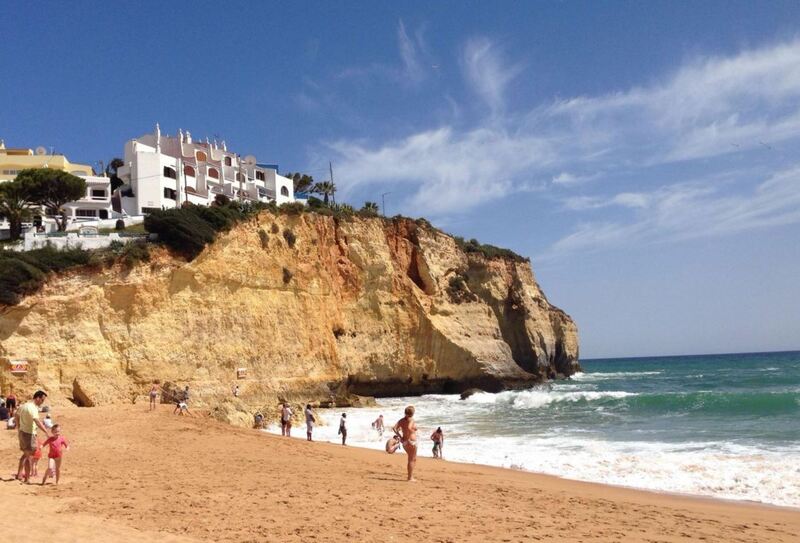 From Carvoeiro beach, just walk to the right and up the hill (rua do paraíso). After walking for a couple of minutes, you will see Praia do Paraíso. There is a stairway with many steps down to the beach. The beach is quite secluded and usually the beach is very quiet. Our tip is to only visit the beach during low tide. Back in the days, Carvoeiro was a fishing village. Nowadays, it is a well-known seaside resort. There are many private villas, hotels and facilities to accommodate tourists in Carvoeiro. The town itself is quite small, but there are many bars, restaurants and shops. Also you will find several supermarkets in the town. 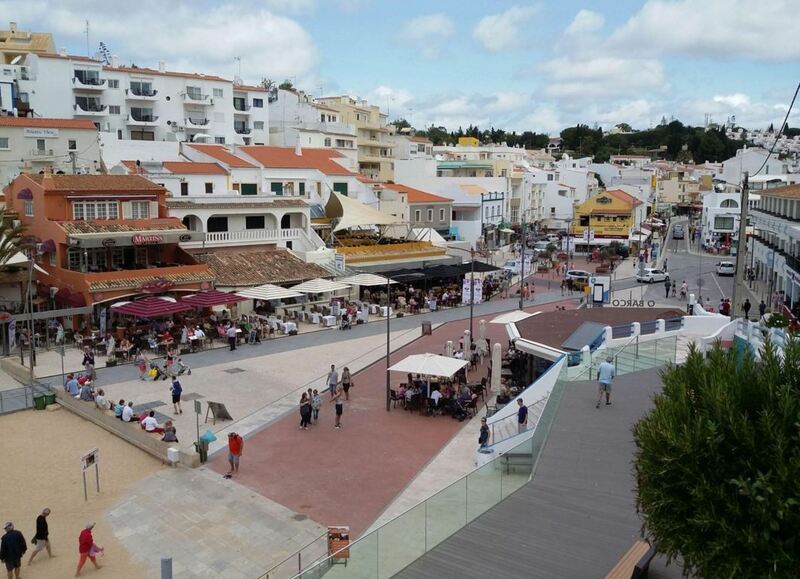 There is one main street of Carvoeiro, which leads to the beach. The beach is really the focus point of the town. On the square near the beach, there is entertainment every evening during the summer. It is a very lively area, surrounded by many bars and restaurants. 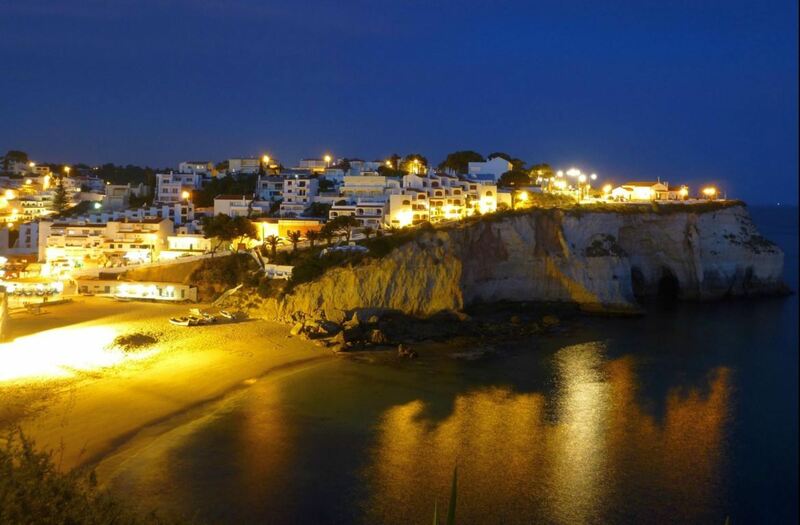 The town of Carvoeiro also looks very nice in the evening. If you like to do sports, Carvoeiro has something for you. You can find several golf courses, tennis clubs, cycling routes, gyms and even diving centers nearby. Carvoeiro is part of the municipality of Lagoa. 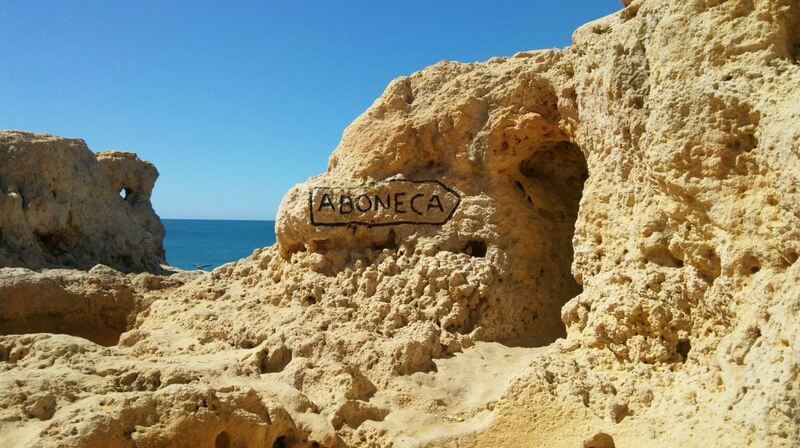 When you are in the city of Carvoeiro, there are signs indicating the beach. Alternatively, you can enter the following address in your GPS: Largo da Praia 16, Carvoeiro, Lagoa, Portugal. However, parking near the beach is very difficult. Your best bet is to park anywhere in the town, but chances are you will have to walk more than 10 minutes to get to the beach. Le Cro Portugal – Tapas. This restaurant offers a great variety of tapas. They also offer very good wine with the tapas. Very friendly staff. They do not have lot of tables, so it might be worthwhile to make a reservation. Paradise Indian Restaurant. This Indian restaurant has very good food. It is one of the best Indian restaurants in the area. Not too spicy, not too mild, but full of flavour. Mar d’Fora. 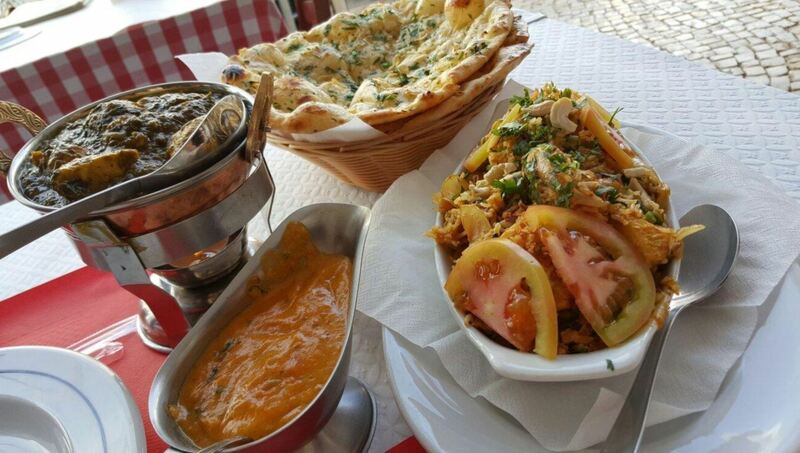 This restaurant has great Portuguese food in a wonderful atmosphere. The sea view is amazing. This is actually a great place to watch the sunset. It is a bit more expensive than other restaurants, but the view and the whole dining experience makes up for it. Vale D’oliveiras Quinta Resort And Spa. This luxurious 5-star hotel is surrounded by lush gardens and palm trees. The hotel offers a relaxing spa, many types of massages and even a gym. Algar Seco Parque. This amazing place near Algar Seco offers rooms with sea view and self-catering. It has a large terrace with several swimming pools. Highly rated. Castelo Guest House. This highly rated guest house offers great value for money, and even has a view over the Atlantic Ocean. 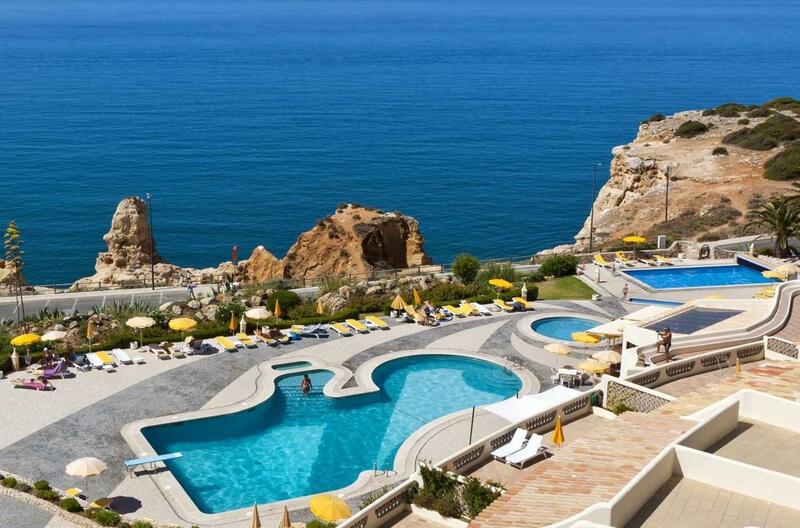 It has everything you need for a great holiday in Carvoeiro. After the busy summer season of last year, we recommend to book your hotel now, as it will probably sell out. Below you can find a map with the location of hotels near Praia do Carvoeiro. By changing the date of your holiday, the map will show you the current prices. Praia do Carvoeiro is an excellent location from where to discover the nearby grottoes and caves. These caves are a beautiful act of nature and provide for wonderful sights to tourists. You can take a boat tour with a local guide, in one of the colourful fishing boats. The guide will take you to the best caves in the area. This boat trip is highly recommended. 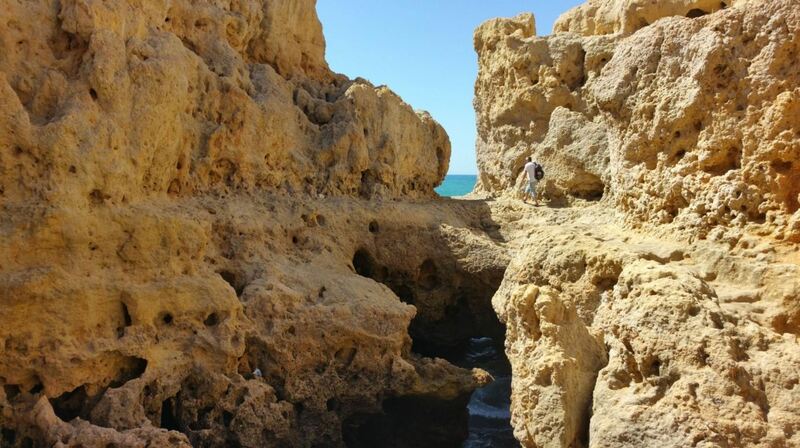 Also make sure to visit the Benagil cave, which is not that far from Carvoeiro. If you are not convinced to take a boat excursion in this area, then let the following video convince you. Some of the best excursions in the area can also be booked online. Below you find our favourite excursions near Carvoeiro. 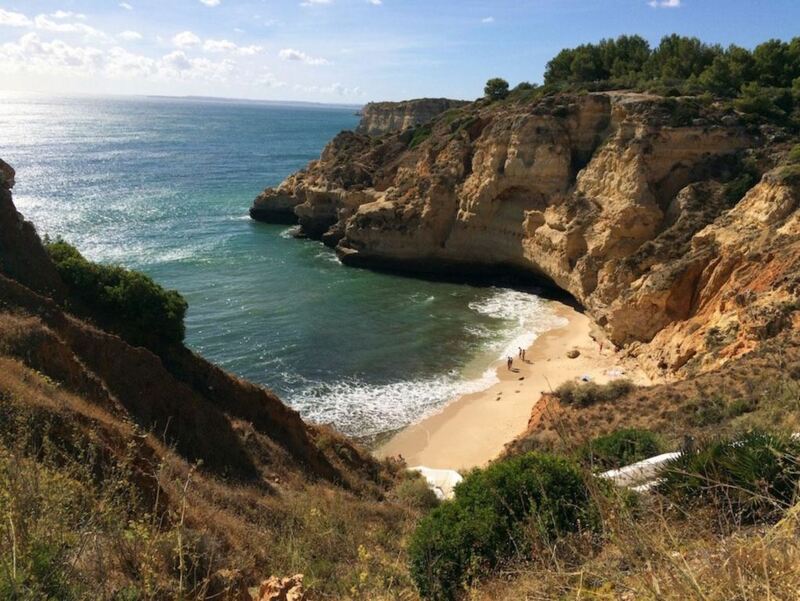 Although the beach of Carvoeiro is too small for a beach walk, there are plenty of other options for hikers nearby. One of the nearest beaches, Praia do Vale de Centeanes, is 2 kilometres towards the east. It is great to walk there from Carvoeiro. For the serious hikers, there is a walking trail called O Percurso dos Sete Vales Suspensos. This walking trail has a length of 5 kilometres, and goes from Praia do Vale de Centeanes all the way to Praia da Marinha. It is one of the most beautiful walking trails in the region. If you don’t like to walk that much and have access to a car, the beaches of Marinha and Benagil are very much worth visiting as well. Since Carvoeiro attracts many tourists, it has all the facilities you could ask for. 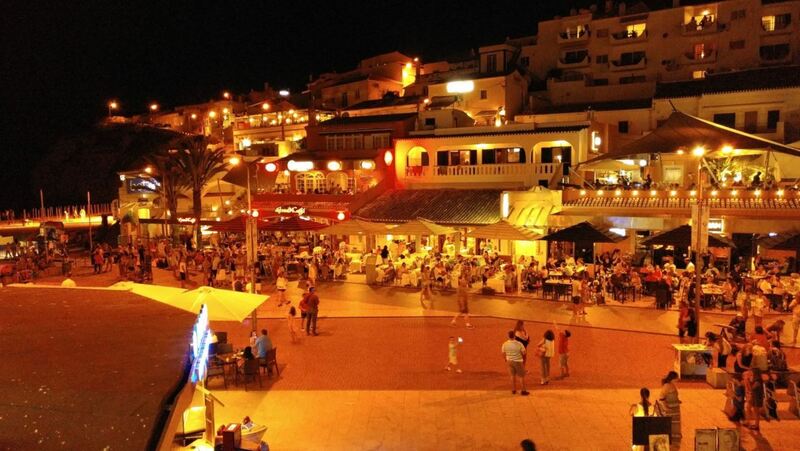 There are many restaurants and bars, as well as hundreds of holiday villas around Praia do Carvoeiro. The beach is easily accessible, also by wheelchair. Praia do Carvoeiro also offers many kinds of water sports. If you are curious to see how the beach looks right now, there is a webcam transmitting live footage.